The stage was damaged in a tyhoon, but now it is repaired. 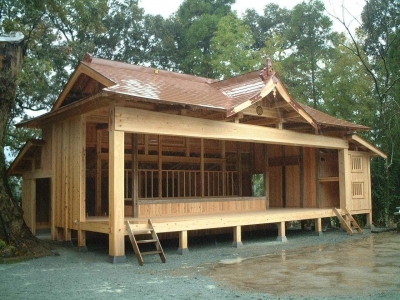 The masonry seating still remains and even today several traditional ritual ceremonies are held on the stage, such as "Ganjo-sai Festival" in April to pray for a huge harvest, and "Aki no Taisai Festival" on October 19. There is a big oak tree on the precinct, on the left side at the stone staircase after you go through the torii gate. This 1000-year-old giant tree is 6.3 meters in girth and 25 meters tall, and is designated as a City's Cultural Property.